"I don't remember calling the feds-a-renos." 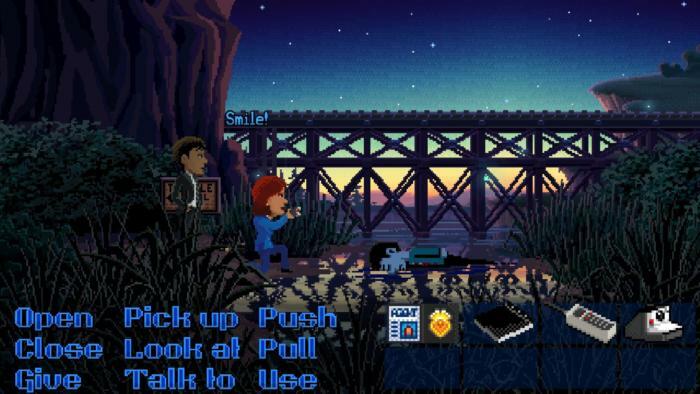 "We want Thimbleweed Park to be like an undiscovered classic LucasArts' adventure game you'd never played before. A game discovered in a dusty old desk that puts a smile on your face and sends a wave of nostalgia through you in the same way it does for us." I lifted that paragraph from Thimbleweed Park's original Kickstarter campaign, a statement of intent dating back to late 2014. It's a captivating idea—a long-lost masterpiece, a video game B-side tucked away and forgotten, perfectly preserved in 1s and 0s on some floppy disk. It's also exactly what Ron Gilbert, Gary Winnick, and co. delivered. 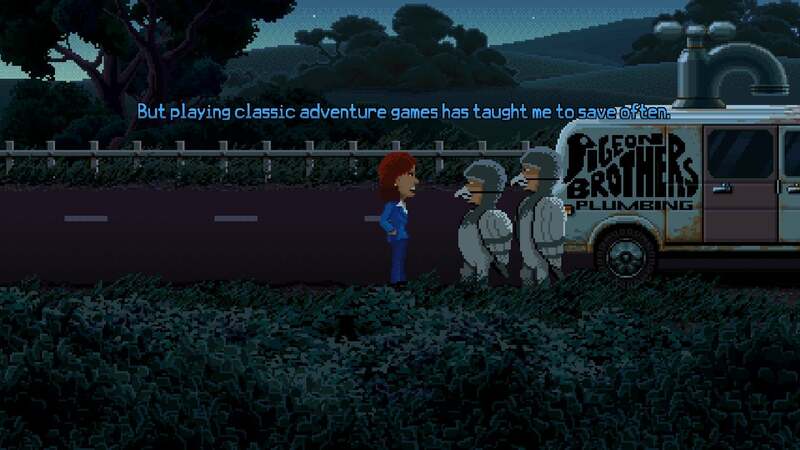 Thimbleweed Park is a LucasArts adventure game, through and through. Sure, the engine is quite a bit more powerful than SCUMM, the dialogue more self-referential, and there are a few modern conveniences baked in. But with minimal tweaking you could've handed this game to me in the early '90s and I wouldn't have blinked. All you have to do is look at it, really. When's the last time you saw a point-and-click adventure game with a block of nine verbs in the bottom left corner? Or with that blocky eight-item inventory in the bottom right? Even Day of the Tentacle Remastered tried to move away from that setup, giving players a radial menu instead. 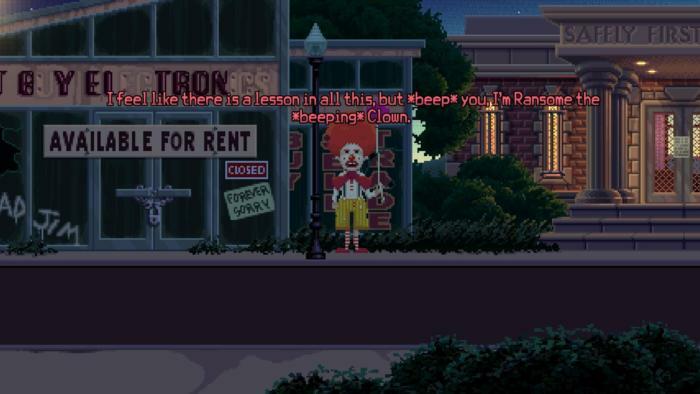 Thimbleweed Park leans into it. It wants you to get into that old rhythm—"Use [BLANK] with [BLANK]," "Pick up [BLANK]," "Give [BLANK]," and so on. Click, click, click, click, click. Not that there aren't a few shortcuts. I'm particularly fond of the alternate controls: "QWE," "ASD," and "ZXC" standing in for the three rows of commands. There are also some contextual commands so that, for instance, right-clicking a door will automatically "Open" it instead of forcing you to manually do so. Much of the fun comes from trying out offbeat combinations and seeing what works, though. Try to give items away, or use items in the dumbest possible manner. See what the game says. Often—not always, but often—you're rewarded with a throwaway line of dialogue or a short gag. It's that weird bastardization, residing somewhere between the seemingly infinite options of an old text adventure and the strictly limited ones afforded a modern, fully contextual point-and-click. 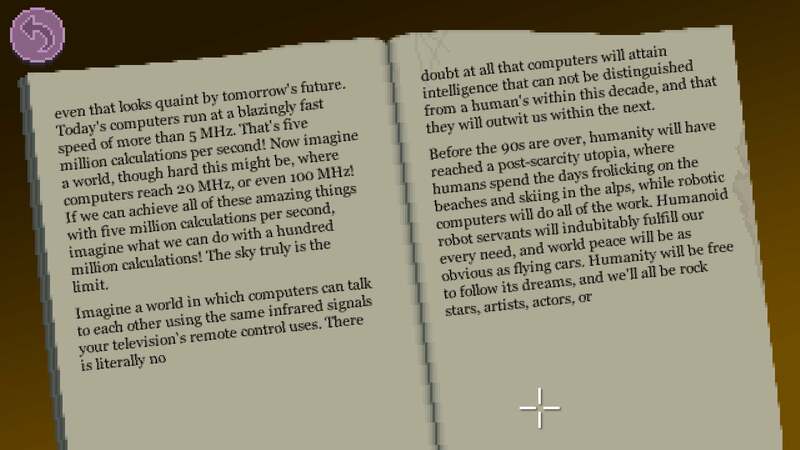 The rest of the fun comes from Thimbleweed Park's writing. There's a lot of it, and it is consistently excellent. It starts small, with two federal agents (or are they?) 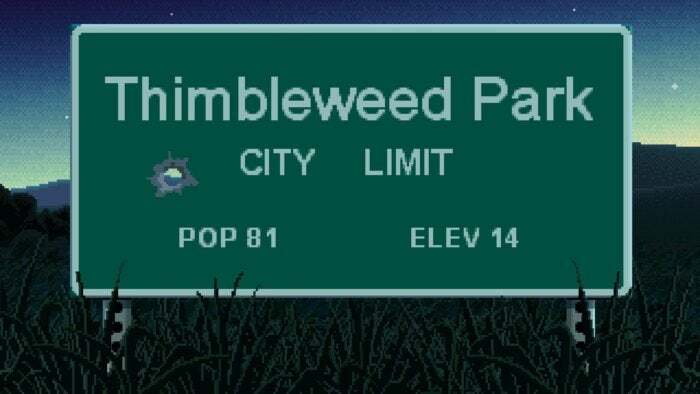 arriving in the titular town of Thimbleweed Park to investigate a murder. There’s a definite Twin Peaks vibe to the proceedings, everything given that “Not Quite As It Seems” vibe. There's also a lot of trope mocking—“The body is starting to pixelate,” “Sounds like someone in the sewer is playing the violin,” and even a self-referential joke about the game being in 2D. And before you know it you’ve been swept up into a town-wide conspiracy, with five playable characters—the two agents, wannabe-game-developer Delores, Ransome the Insult Clown, and Franklin. Franklin the ghost, I should specify. It’s ambitious—Maniac Mansion, but with a modern spin. Moreover, it’s hilarious. Delores’s constant cracks about game development and adventure game design are particularly solid, but Agent Ray’s cynicism and some of Ransome’s dumb swear-filled insults also elicited laughs. Comedy in games is difficult, and the old LucasArts games are still in many ways a high-water mark. 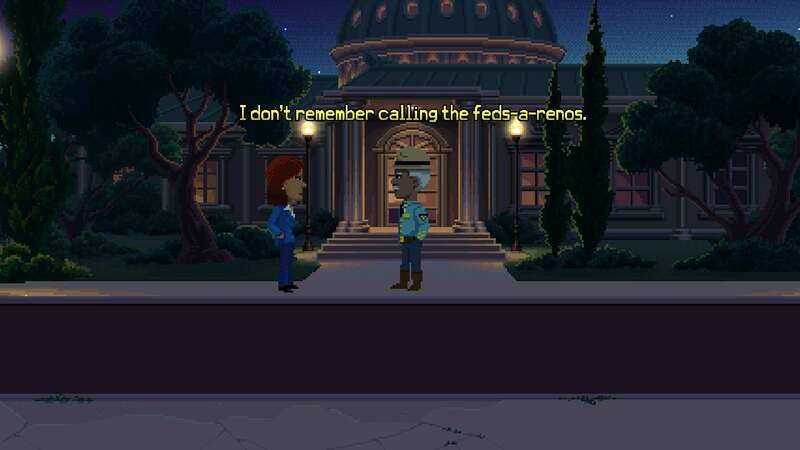 Thimbleweed Park does them proud. Not all the various story threads are given their due—I feel like you can see the team running up against budget limitations, especially in the latter half of the game. Events are more constrained, dialogues more limited, with fewer new locations and discoveries compared to the almost-overwhelming front half. Worse still, some of the town’s stories just flat-out end, with no real resolution. Franklin in particular is underutilized, I think. But it’s wonderful overall. I don’t want to dwell too much on the writing because, well, the writing is why you’re here. Best to just say the game is full of unique characters and situations, many of which I’m still quietly laughing about as I write this review. It’s one of the most creative point-and-clicks I’ve played in years, despite the fact it’s emulating adventure games you played 20-odd years ago. It also, for the record, has the best backer-produced content I’ve seen in a game. There’s an entire library full of backer-written “books,” like Demonology for Dummies, Eating Peanuts: A Guide, and Raisin Based Economy. You can also call random phone numbers and hear recorded voicemail messages from backers, many of which are just as silly. But I did say this is a LucasArts game through-and-through, right? With that comes some baggage I’m not quite as excited about. To its credit, Thimbleweed Park includes two difficulty levels: “Casual Mode” and “Hard Mode,” the former of which strips out some of the more obtuse puzzles and gives players a more streamlined experience. 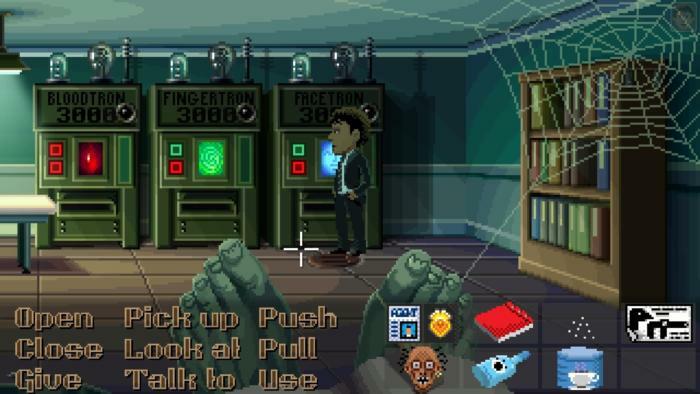 If you’ve never played an old LucasArts game, consider starting there. It’s a tough decision, though. When I read the descriptions, I couldn’t help but feel like Hard Mode was “The Game As Intended” and Casual Mode was a lesser version. You’re missing out on puzzles, which themselves are the source of much of Thimbleweed Park’s humor! Surely that’s not good! So I played on Hard Mode, and wow, some of the puzzles are straight out of the ever-so-convoluted ‘90s Adventure Game Puzzle Design Handbook. There will be those who love that—again, it’s just like someone discovered an old LucasArts adventure game sitting in a drawer. But there were a handful of puzzles I really came to resent during my time with the game. The worst ones, in my opinion, involve lengthy and unskippable animations in order to set the puzzle up. I’ll try to keep spoilers to a minimum here but there’s a puzzle that necessitates climbing a radio tower in order to flip a lever. It takes fully 15-20 seconds to climb the tower, and there aren’t even enough dialogue barks for your character to cover the journey—they repeat before you’ve reached the top. If you don’t solve the puzzle the first time? Or the second, third, fourth, or fifth? You’ll have to, again, send your character on that same tedious 15-20 second climb. 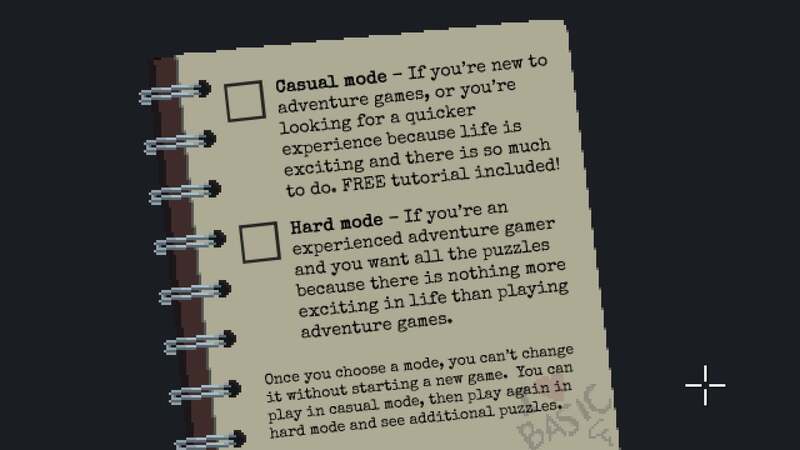 Taking a look at the Casual Mode walkthrough it seems like this particular puzzle and a few of the other more egregious ones have been removed, as well as a few not-so-difficult puzzles. It’s your call which mode you choose. Personally I’d say play on Hard and just consult a walkthrough if you feel it’s necessary, but that’s your decision. Adding to the puzzle difficulty is the way characters are managed. Each of your five playable characters has their own inventory, and solving puzzles often involves handing items back and forth to the appropriate person. This is often a good thing—characters have unique dialogue for many items. But it can get frustrating especially in the latter half of the game, with the map expanded to its full size, when sometimes the “difficult” part of a puzzle is just getting two characters into the same place at the same time. This is doubly problematic because on rare occasions characters are removed from your control for story reasons, along with their inventories. Just realized you need an item you left on that other character? Too bad, because you’ll have to wait 5 to 10 minutes for them to return. I won’t spoil why that happens, but will say it’s frustrating the times it does. And while I grew a bit annoyed at how many seemingly useless red herring items are in the game, I was doubly annoyed at how cavalier the game is with your inventory. Thimbleweed Park is split into eight chapters, and sometimes the game just decides to pare down your inventory without warning, removing a bunch of fun items before you’ve really explored their potential. A shame. It’s a LucasArts adventure game though, or at least a damn good imitation, and many of these issues are part and parcel with emulating that early-’90s design. I’m not sure any of it could be modernized without wrecking the spirit that makes Thimbleweed Park unique to begin with. Thimbleweed Park is excellent, both as tongue-in-cheek homage and in its own right. It’s a LucasArts adventure game the way you remember them being, with the same witty humor and, yes, the same sometimes-asinine puzzles. The good and the bad. And really, I don’t think fans would want it any other way. 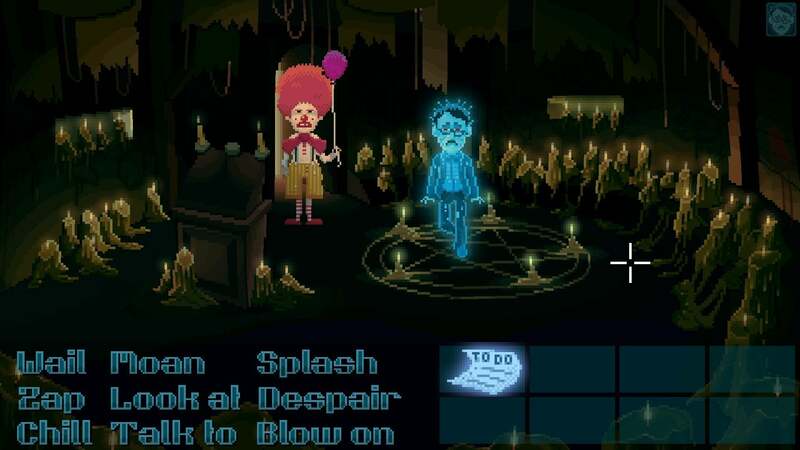 Thimbleweed Park is a LucasArts adventure game the way you remember them being, with the same witty humor and—yes—the same sometimes asinine puzzles.